Trick or treat! Halloween is just a few short weeks away! And at Eat’n Park we’ve got some scary good deals that are sure to satisfy all the ghouls and goblins in your haunted mansion. 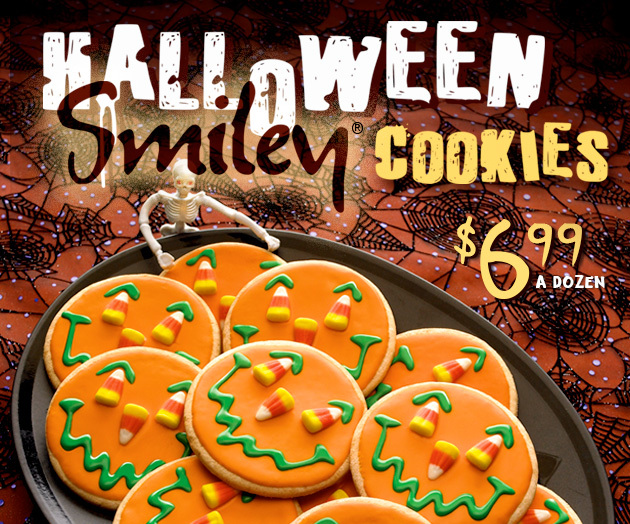 Since Smiley Cookies taste better than candy, pick up some Halloween Smiley Cookies for only $6.99 per dozen! With candy corn eyes and a crooked smile, they’re hauntingly delicious! And don’t forget that SmileyCookie.com has everything you need to prepare for your Halloween party, including fun new designs such as Witches, Vampires, Black Cats and Zombies! You can also order any of these spooky treats individually wrapped treats for your neighborhood trick-or-treaters! 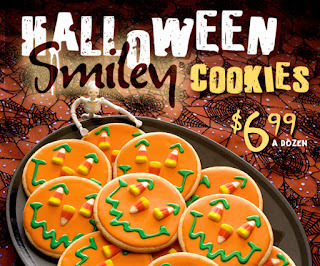 Mini Halloween Smiley Cookies are available in cases of 40, 80 or 160, and traditional Halloween Smileys in cases of 50. Order today and get free shipping with the coupon code "BOOSHIP" on any order over $20! Coupon expires on October 13th and is not valid on gift cards. Is your schedule jam packed due to after school activities? Have one less thing to worry about tonight with Eat’n Park takeout! Plus, you can use this coupon for $3 off your next purchase of $15 or more! Coupon valid Monday, September 14 – Sunday, September 20, 2015 only. 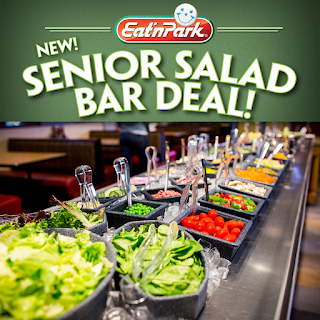 Check out our new Senior Salad Bar Deal! Monday-Friday from 2-5 PM, any guest 55 and older can enjoy our Soup, Salad & Fruit Bar for just $6.99 with the purchase of a drink. Now that’s a deal that is sure to make you smile! We love soup, so we’re celebrating “Souper September” all month long by offering $5.99 quarts of soup to go with any takeout purchase! 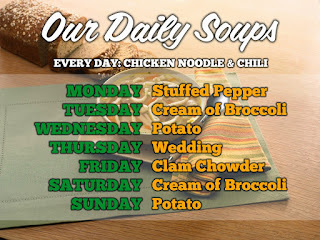 Better hurry in soon - "Souper September" ends on Wednesday, September 30th! Fall is here and that means changing leaves, Friday night football games, and our brand new fall menu! Read on for all the delicious details. A must try for waffle lovers everywhere! 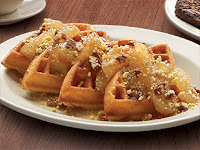 This breakfast boasts a freshly made waffle that’s topped with warm cinnamon apples, candied pecans, and finished with a sprinkle of streusel. 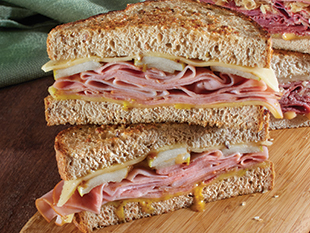 For all those who enjoy our Eat’n Smart items, this low-calorie delight will be the perfect breakfast fit! It features Quaker oatmeal topped with warm cinnamon apples and our housemade granola. 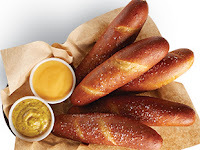 Our Pretzel Sticks are perfect for sharing with friends or keeping all to yourself! We serve it with cheese sauce and mustard for dipping so there is something for everyone to enjoy! This savory sandwich features sliced ham, smoked Gouda, grilled marinated Granny Smith apple slices, and sweet mustard on grilled freshly baked six grain bread. Plus, it’s served with your choice of one side. 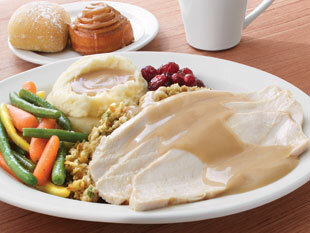 Why wait until Thanksgiving when you can have your turkey dinner now?! This feast includes oven-baked turkey, stuffing, cranberry sauce, and mashed potatoes with gravy. Plus, you also get your choice of one side and bakery-fresh rolls. Warm up with this dish that’s perfect on those soon to be brisk nights. 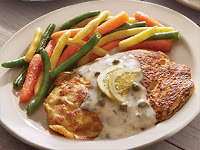 It features our housemade chicken Romano topped with white wine sauce, capers, and fresh lemon. Plus, it’s served with your choice of two sides and bakery-fresh rolls. For those times when nothing but pasta will do, our ziti is baked with sliced Italian sausage, marinara sauce, and mozzarella cheese. We complete this dish with your choice of one side and garlic toast. There is nothing better than warming up on a autumn night with our Mulled Apple Cider. It even comes with one free refill! You can also order a refreshing cup of Chilled Apple Cider for only $2.19! Like what you see? 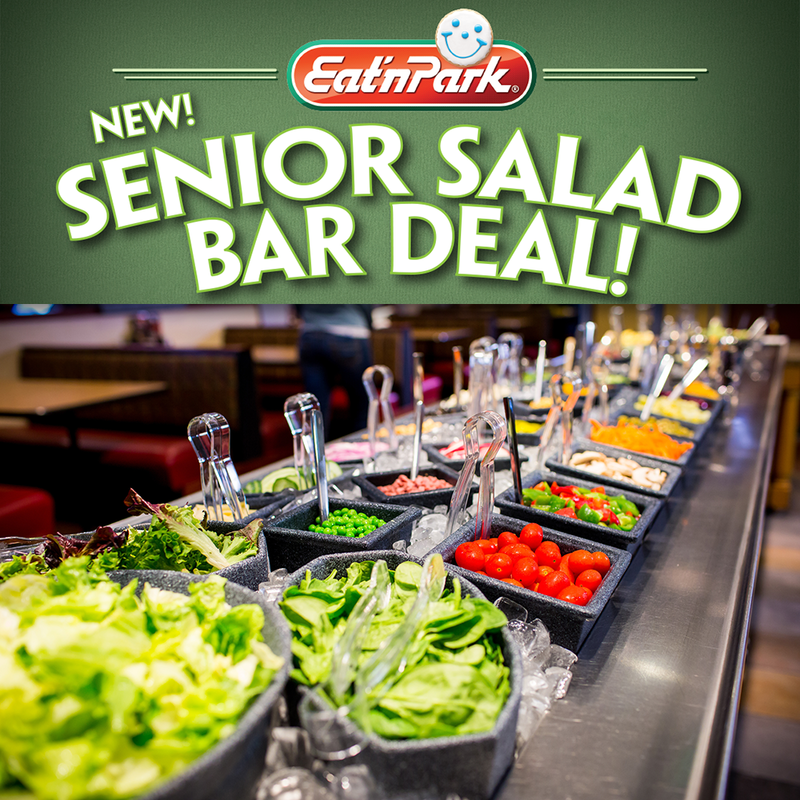 Then you’ll LOVE our new lineup of Salad Bar Dinner Deals! We’re shaking up our Salad Bar Dinner Deals roster with new dinner selections! Available from 4-9PM, enjoy any of these delicious dinners, paired with our endless Soup, Salad and Fruit Bar! 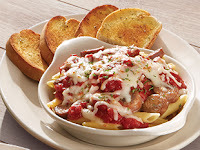 Stay warm with our new dish that is perfect for fall. It features our housemade chicken Romano topped with white wine sauce, capers, and fresh lemon. Plus, it’s served with your choice of one side, bakery-fresh rolls, and our Soup, Salad and Fruit Bar. Sometimes you just need a classic dinner like our baked ziti with sliced Italian sausage, marinara sauce, and mozzarella cheese. We complete this dish with a side of garlic toast and our Soup, Salad and Fruit Bar. You’ll be Eat’n Smart with this low calorie meal that is packed full of flavor. 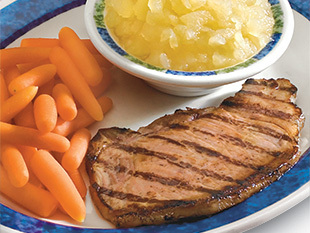 This robust pork chop is marinated in a mixture of sesame, garlic, ginger, and teriyaki sauce. It’s delicious and is served with one side, bakery-fresh rolls, and our Soup, Salad and Fruit Bar. Seafood at it’s finest. 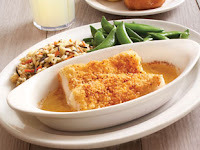 This plate includes a filet of cod baked with a buttery breadcrumb topping. It’s served with your choice of one side, bakery-fresh rolls, and our Soup, Salad and Fruit Bar. One of our all-time guest favorites (and ours)! 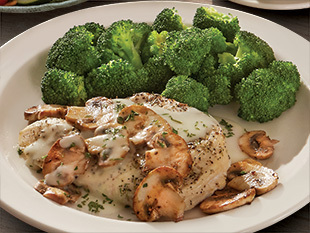 We make it with tender boneless chicken breast that’s seasoned with rosemary and black pepper. Then, we top it with sautéed mushrooms and a tasty white wine sauce. It’s served with your choice of one side and our Soup, Salad and Fruit Bar. Don’t forget to check out what’s new on our menu, just in time for fall! Don’t labor over the oven this weekend – let us do the baking for you with this coupon for $1 off a whole pie or a dozen Smiley Cookies! Coupon valid Friday, September 4 – Monday, September 7, 2015 only. We’ve got pumpkin fever, yes we do! We’ve got pumpkin fever, how about you? Are you as excited as we are for the pumpkin party to start? Stop in today to use this coupon for $1 off any pumpkin purchase! Coupon valid Tuesday, September 1 - Sunday, September 6, 2015. Pumpkin Latte: The perfect way to start your day. 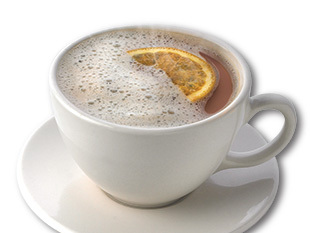 Pumpkin Chai Tea: Chai Tea infused with fall. 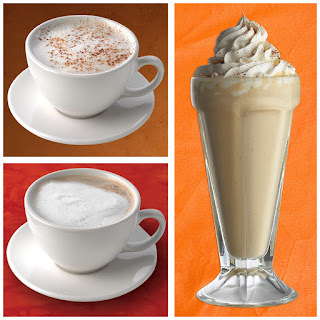 Pumpkin Pie Milkshake: A sinfully delicious pie in milkshake form. Go ahead… have your pie and drink it, too! Pumpkin Pie: Made fresh daily! Pumpkin Crème Pie: A delightful twist on our traditional pumpkin pie. Labels: Coupons, What's on the menu?